With a People Mover train pulling up every three minutes, special event transportation has never been more efficient, or cost-effective. Convention Fast Passes are ideal for conventions or special events. Go virtually door-to-door on the downtown circuit from major meeting, eating and lodging venues to the Cobo Convention Center or Marriott Renaissance Center. With its elevated downtown route, your group can hit all the high spots in just minutes. 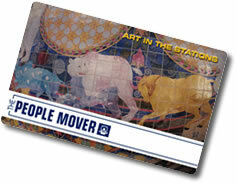 The passes provide unlimited rides on the People Mover for only $1.50 per day for each day of your event. Passes may only be purchased directly from the Detroit Transportation Corporation and a minimum 50 passes is required, with programming for three days or more. Convention Fast Passes are not sold at People Mover stations. Please visit the DPM e-store to purchase passes or send us the order form below. Tokens may be purchased in bulk for distribution. Please download the order form below for pricing, terms and conditions.